We interviewed the client for approximately two hours. We were able to ask her several in-depth and sincere questions. I was totally engaged and listening to learn and empathize. At the proper times, my mind was filled with thoughts and concepts that might help what they are trying to accomplish. I recorded my thoughts and impressions. I recorded them very roughly, but I had to be quick as the key concepts came to the surface. We found out they were offering to people to offer their talents in art and photography to put cool pictures on their site in lieu of giving money. I ended up thinking this concept had no real relation to how they needed to get more money for rescue missions. We learned that the most helpful thing people could do for them is to give actual monetary donations. I wanted to gain sincere empathy for the victims, the founders of this organization, and the gut-wrenching problem of child trafficking in the world. 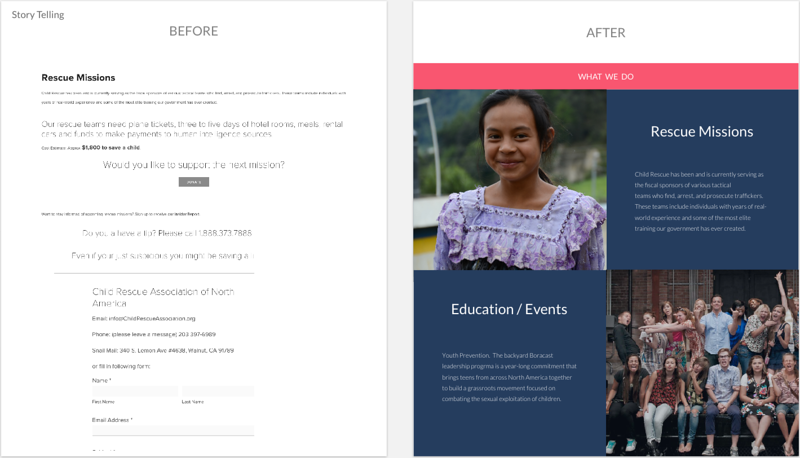 I wanted to create a better first impression of the website: To easily glance at it, understand what’s going on, and be inspired the help the cause. I wanted something really beautiful and inspiring, but I didn’t want to over Dribbbilizate the design. I wanted to make it extremely easy and functional. I asked specific questions to the client about the general theme. I asked if they wanted the images to be dark and troubling where the children look abused. She said no. They wanted the theme to be more bright and positive, but at the same time give the audience some insight into the grave nature of child slavery. I very much agreed with this direction. Normally I would wireframe a product first, but with this one I needed to wrap my head around the architecture of the message. So I gathered all the different concepts and grouped them into some rough and general categories and sub-categories. 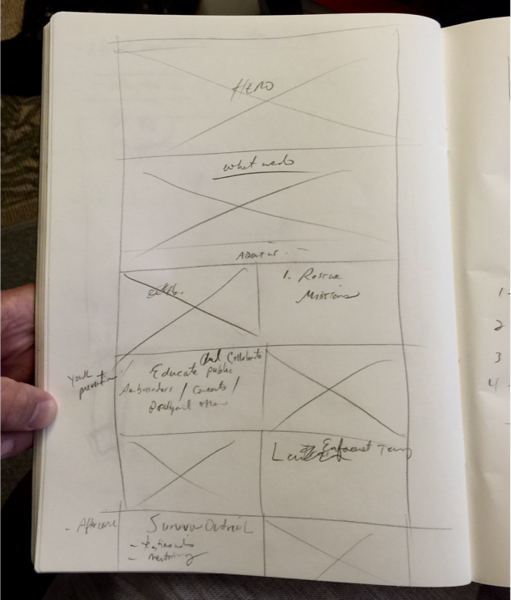 Immediately after the client interview, I could conceptualize the general wireframe I wanted. 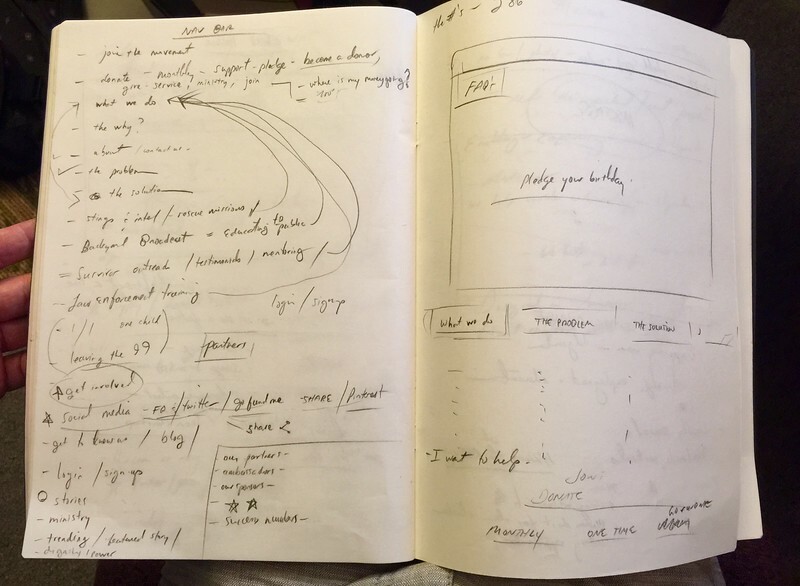 I wanted content blocks to tell a story that were easy to understand. I wanted the story to flow properly.